(Bloomberg Opinion) -- One year in, how’s President Donald Trump’s mission to save the U.S. steel and aluminum sectors going? Judging by the stock prices of metal producers, you could be mistaken for thinking he’s trying to destroy the industry instead. The aggregate market capitalization of the seven major U.S. primary steel and aluminum producers — Nucor Corp., U.S. Steel Corp., AK Steel Holding Corp., Steel Dynamics Inc., Commercial Metals Co., Alcoa Corp. and Century Aluminum Co. — is now down about one-third since Jan. 11 last year. That’s the date that the U.S. Commerce Department sent the White House its section 232 report, providing the basis for the 25 percent and 10 percent tariffs on, respectively, steel and aluminum imports which took effect at the start of June. The damage has been broadly shared. While 2018 was the worst year for Nucor shares since 2008, if anything it’s the outperformer of the group. Shares in U.S. Steel and Alcoa, two of America's most storied businesses, are down around 45 percent over the past year. Their less venerable competitors AK Steel and Century Aluminum have fallen close to 60 percent. 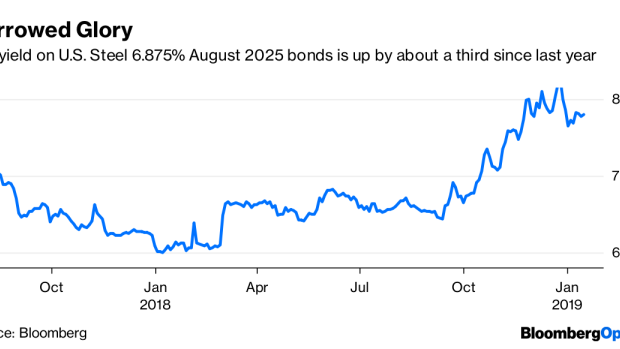 It’s not just skittish equity investors overreacting, either: The yield on U.S. Steel’s 6.875 percent August 2025 bonds rose by more than a third from the start of 2018, hitting a peak of 8.3 percent earlier this month. While we’ve long warned about the effects of the Trump administration’s metal tariffs on the domestic companies that consume American steel and aluminum and employ the larger share of the manufacturing workforce, the extent of the malaise around the policy’s beneficiaries is striking. Operationally, the tariffs seem to be doing the job. The June and September quarters of 2018 saw our group of companies post their largest aggregate profits since 2008. Steel Dynamics reported record earnings in the third quarter. While that's yet to make an impact on employment — there were just 200 extra jobs in the U.S. primary metal manufacturing sector in December compared to a year earlier, according to the Bureau of Labor Statistics — it’s not nothing. So what’s the problem? Ultimately, the shares of U.S. metal manufacturers are weak not because their earnings are poor, but because their valuations have fallen to their lowest levels since the 2008 financial crisis. Investors simply don’t believe that the current good times will last. They’re right to be skeptical. As we’ve argued previously, the problem for U.S. steel was never so much about a glut of Chinese metal as the never-dealt-with overcapacity in America’s own domestic industry. (Its aluminum smelters, similarly, have been stymied by the fact that they’re high-cost and using outdated technology). The smart way to deal with that is either to cut capacity, or invest in better technology — or better still, do both. The path of least resistance, though, is to work the levers of power in Washington to prop up your business at the expense of your consumers by raising barriers to cheaper foreign competitors. That’s essentially what U.S. policy is now doing. Far from cutting their coat according to their cloth, U.S. metal producers are now ramping up instead. Between 11.2 million metric tons and 11.9 million tons of new capacity, equivalent to as much as 10 percent of 2018 consumption, is slated to hit the U.S. market by the end of 2022, according to Bloomberg Intelligence analyst Andrew Cosgrove. That might seem viable in the context of the walled garden that President Trump has built around America’s domestic metal industry. But with their customers increasingly under pressure amid rising costs and weakening demand, the better bet is that the barriers will be taken down by this administration or its successor. When that happens, a U.S. industry that’s depended on government support rather than innovation to keep it afloat will be left exposed, having fallen still further behind its international competitors. Trump’s tariffs aren’t helping American steel and aluminum. Instead, they’re killing it with kindness.